Egypt's constitution: Who's backing it and why? Egyptians will go to polls on 14-15 January to vote in a national referendum on a new constitution. Egyptians living abroad cast their votes from 8 to 12 January, and according to government figures, 103,000 votes were cast by expats around the world. The vote marks the first time Egyptians have gone to the ballot box since Islamist president Mohamed Morsi was removed from office on 3 July. On 30 June 2013, Egyptians turned out in their millions to demand the removal from power of Morsi and his Muslim Brotherhood movement, and the implementation of a new political roadmap. The Tamarod (Rebel) movement and the secular National Salvation Front (NSF), which claimed to have collected an estimated 22 million signatures calling for Morsi's ouster, said the roadmap should suspend the 2012 Islamist-drafted constitution and replace it with a new charter, appoint the head of the High Constitutional Court as interim president, and hold fresh presidential elections as early as possible. Gamal Zahran, a political science professor at Suez Canal University, agrees that the first stage of the roadmap – drafting a new constitution – has been completed successfully. "This was achieved in spite of a very hostile press campaign from the West and violent street protests by the Brotherhood," says Zahran. Zahran believes the army-backed interim government has successfully weathered Western pressure, imposed discipline on the streets and recovered "at least 70 percent stability" across the country. "As a result, and in spite of Brotherhood threats to disrupt the ballot, I think the referendum will be held in a peaceful and democratic atmosphere," says Zahran. He says most political factions joined the 50-member constitution-drafting committee, which will contribute to the charter's smooth endorsement. "This is in sharp contrast to last time when Egyptians were left sharply divided after the Islamist-drafted constitution passed by a thin majority," adds Zahran. Ziad El-Oleimi, a high-profile member of the youth coalitions that forced former president Hosni Mubarak from office in 2011, begs to differ with Zahran. El-Oleimi agrees the interim government has silenced the Brotherhood and other secular opposition forces ahead of the referendum. "But this came at a high cost, with hundreds killed in violent clashes, and against the backdrop of calls for [army chief] Abdel-Fattah El-Sisi to return Egypt to military rule," he says. El-Oleimi says loyalists of Hosni Mubarak's now-defunct National Democratic Party (NDP) – popularly called "feloul" – have recently regrouped to support the new constitution and back El-Sisi for president. 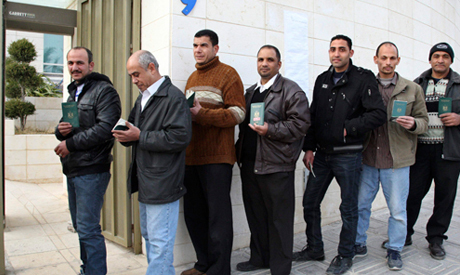 "As a result," says El-Oleimi, "I do not think the referendum will bring anything good. It will pave the way for El-Sisi and the return of the Mubarak regime in a different shape, rather than solve the country's deep political crisis – we need an inclusive civilian democracy." The Egyptian Social Democratic Party – of which El-Oleimi and interim Prime Minister Hazem El-Beblawi are members – says it strongly supports the new constitution. Party chairman Mohamed Abul-Ghar was a member of the constitution committee. Leaders of most liberal and leftist political parties also support the new constitution, holding public rallies in recent days to mobilise their members for a yes vote. More significantly, the ultraconservative Salafist Nour Party, which backed the 2012 constitution, is also backing its replacement. "I think Nour's active participation in drafting the new constitution and drumming up public support for it has largely isolated the Brotherhood and helped create a kind of national consensus ahead of the vote," says Zahran. A handful of low-profile political parties allied with Muslim Brotherhood oppose the constitution. A number of other groups who supported Mohamed Morsi's ouster have opposed the new consitution and will either vote no or boycott the polls; these include the Strong Egypt Party led by Abdel-Moneim Abul-Fotouh, the April 6 Youth Movement, the Revolutionary Socialists and some small Salafist factions. The majority of judges have agreed to oversee the referendum, in contrast to 2012 when many judges refused to supervise the referendum because of their opposition to the Brotherhood's hegemony. Between 14,000 and 16,000 judges are expected to supervise voting this week at 35,000 polling stations. What next after the referendum? Analysts have drawn up a number of scenarios for the post-referendum period. Ali Awad, a constitutional advisor to interim President Adly Mansour, notes the roadmap specified the referendum would be followed by parliamentary polls. "But after President Mansour held a series of meetings with high-profile public figures and representatives of most political factions last month, a consensus emerged over the necessity of changing the roadmap, with the majority in favour of presidential elections before parliamentary polls," says Awad. However, adds Awad, "President Mansour couldn't endorse any changes to the roadmap ahead of the referendum scheduled this week. "If the referendum gets a resounding yes, it would help demands for early presidential elections gain greater momentum." Zahran argues that a strong yes vote would open the door for a presidential run by army chief Abdel-Fattah El-Sisi. "I think this week's vote will be as much about the popularity of El-Sisi as an endorsement of the new constitution," he says. In a meeting with army officers and public figures on Saturday, El-Sisi appealed for a large turnout in the referendum "so as not to embarrass the army before the entire world." Several political factions, including National Salvation Front leaders, have recently called for El-Sisi to stand for president. However, Sameh Ashour, chairman of the lawyers syndicate and a leading NSF member, says the NSF has not made an official decision on El-Sisi's nomination. Emad Gad, a political analyst at Al-Ahram, insists that "El-Sisi's nomination should not mean other political factions refrain from fielding rival candidates. "If no one fields candidates against El-Sisi, we are back to a Mubarak-style presidential ballot," warns Gad. In that case, Gad adds, "El-Sisi's nomination will trigger criticism from hostile anti-military Western media figures and officials. They will probably label the presidential election a farce, while the Brotherhood will push its narrative that El-Sisi led a coup against Morsi to end the January 2011 revolution and return Egypt to military rule." Another Al-Ahram analyst, Wahid Abdel-Meguid, insists "holding presidential elections first should not be seen, as many would like to view it, as giving El-Sisi carte blanche." "If Mansour endorses the scenario of presidential election first, he should indicate in clear-cut terms what the powers of the elected president we be until a new parliament is elected," he adds, proposing that the 50-member constitution committee should act as an interim parliament with legislative and supervisory powers until a parliament is elected. El-Oleimi supports holding parliamentary elections first, predicting early presidential elections could "trigger greater violence on the streets." "The Brotherhood takes El-Sisi as their number one enemy and if he comes to office as president, members will step up their protests, ending the chances of stability and making El-Sisi appear a liability rather than a saviour," El-Oleimi adds. No one has ever won an election or a an initiative around the world by boycotting. Most elections or initiatives are lucky to have 60% participation. The Muslim brotherhood terrorists know full well they will be embarrassed. So their only hope is a boycott to give the appearance of inflated numbers by claiming all that did not participate for one reason or the other is a supporter of the Muslim brotherhood terrorists. Desperation has no limits with terrorists.